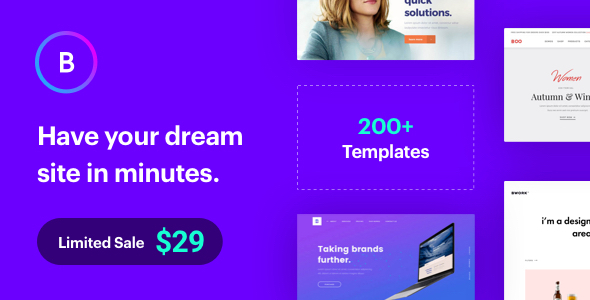 Boo latest v3.3.1 | Responsive Multi-Purpose Theme is powered by visual composer, the powerful visual builder witch stands at the core of wordpress Boo theme. The simplicity with who you will build or edit page will blow you way. Finish your project much more faster with Boo wordpress theme download. Pre-Built Websites Our state-of-the-art websites will jump-start your website by giving it an expert look. Install with just a single click. Features may be combined at will. The style editor allows you to customize your website in real time and see the results instantly. Stunning layouts unlimited portfolio layouts, customizable hovers, cool animations and much more. Browse and select the theme boo.zip file to ‘Upload’. If you can’t solve a problem please open support ticket at https://wphue.com/support-ticket/ with your website credentials? This version will not download demo content without proof of purchase (from Themeforest). Is this version nulled? Hi, this theme included with one click demo content, you can easily import demo content. Hi guys, i bought this theme today, but when i want to import the theme, they said Boo theme is not activated. How to One click Import Demo without activating the code? I will give you the original theme and this theme working without activation code. Just skip activation notice to import the demo content. Hi admin, how you give me the original theme? Can you give me the step to import demo content without activating the code?